Concept artist pulls designs, says classic cartoon characters planned to appear in sequel. Earlier this week, fans got excited when artist Tsvetomir Georgiev posted what appeared to be conceptual designs for new versions of classic villains Krang, Bebop & Rocksteady that may have at one point been planned for Michael Bay's TMNT reboot. Less enthused was the studio, which subsequently requested that all sites remove the images as they had not been cleared for official release. Now, we may know what that meant: In an update to his Facebook explaining the removal of the images, Georgiev writes: "I have to take down some of my TMNT designs , because they are for next TMNT movie that is not released yet." Though not an official confirmation, it's the first word associated with the production to give any indication as to what fans might expect from a prospective sequel to the high-grossing but critically-panned feature. If correct, it would mark the first adaptation of these characters to live-action. All three were original creations of the 80s TMNT animated series, and did not appear in the original comics nor in most subsequent adaptations. 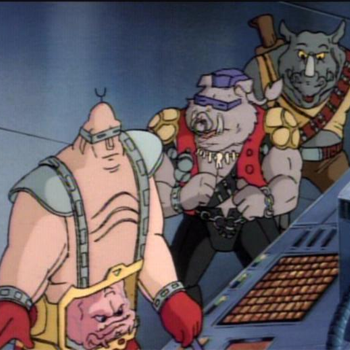 As depicted in the cartoon, Krang is a sentient brain from Dimension X who commands The Shredder; while Bebop & Rocksteady are a pair of henchmen mutated into a warthog and rhinoceros in order to make them more formidable opponents for the Turtles.